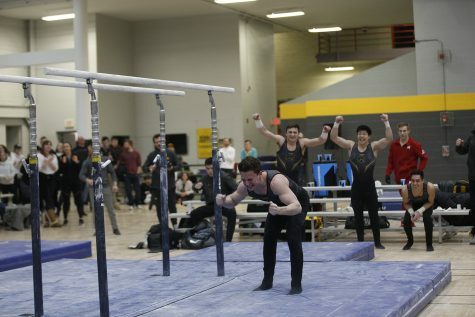 Both the men's and women's gymnastics teams lost but saw improvement. 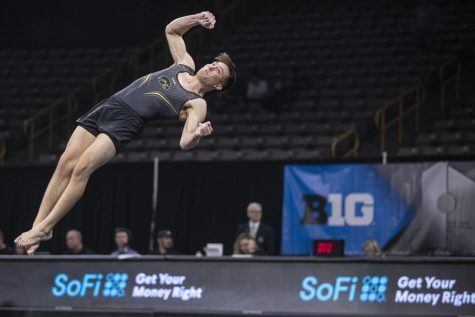 The Iowa men’s and women’s gymnastics teams both teams fell short of victories this weekend. 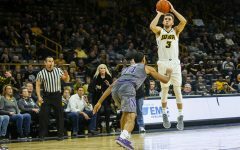 The men’s team hosted top-ranked Oklahoma in Carver-Hawkeye on Saturday. The Hawkeyes fell short with the final score being 405.150-397.750. Though the team lost, junior Andrew Herrador took first place in the all-around competition with a 78.650. Freshman Evan Davis followed suit. The freshman was only .300 behind Herrador to take second place in the all-around. 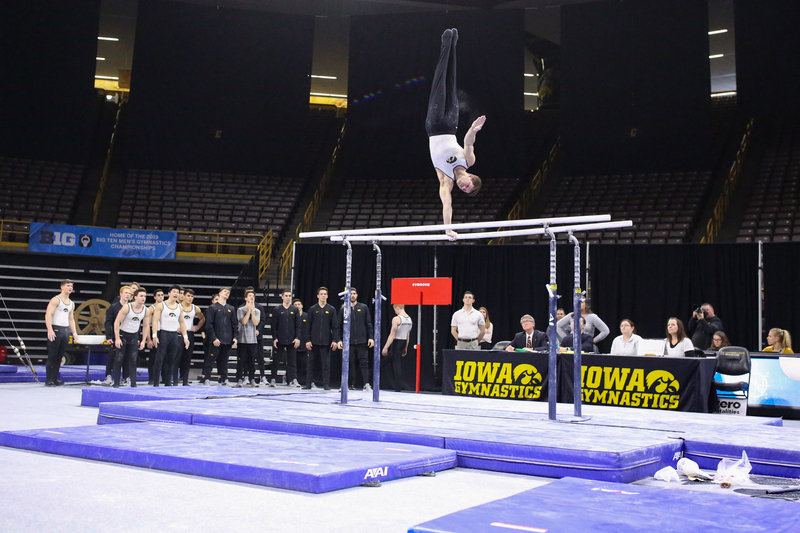 The Hawkeyes not only struggled during the meet but a bit in practice this week. 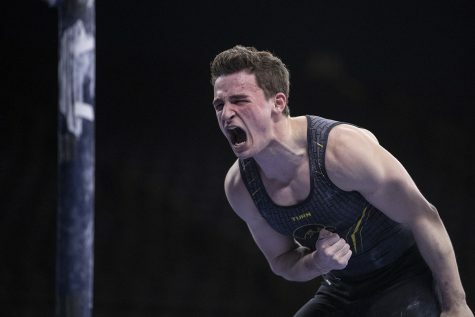 The Hawkeyes started the meet on the floor where they were able to take a lead over the Sooners, but after the Hawkeyes went onto pommel horse, some worry set in for Reive. Overall, the Hawkeyes had 13 scores go down in the record books for season-highs and career-bests. 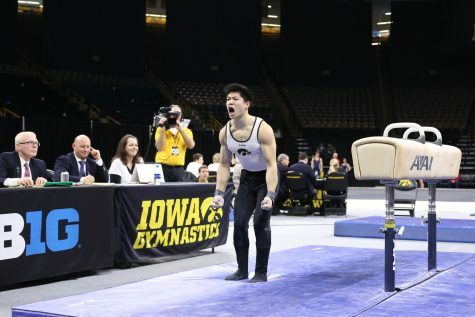 In its third rotation, Iowa went onto rings where the team scored a season-high 66.900, with junior Brandon Wong leading the Hawkeyes with a career-best 13.550. Sophomore Bennet Huang and Herrador both earned career-high scores on vault with scores of 14.450 (third) and 13.850 (11th), respectively. 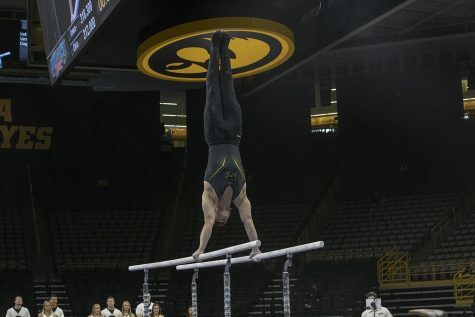 Senior Rogelio Vazquez tallied his season-best on parallel bars to give him second place, leading the Hawkeyes to a 65.850 team score. 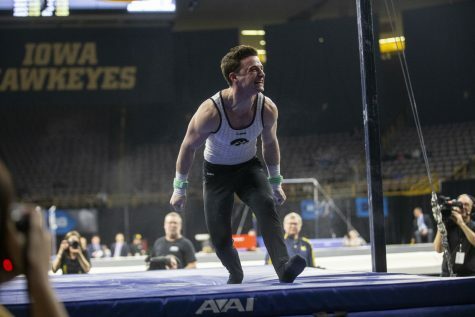 The final rotation for Iowa was on high bar where the junior Mitch Mandozzi led with a career-best of 13.600 giving him third place overall. 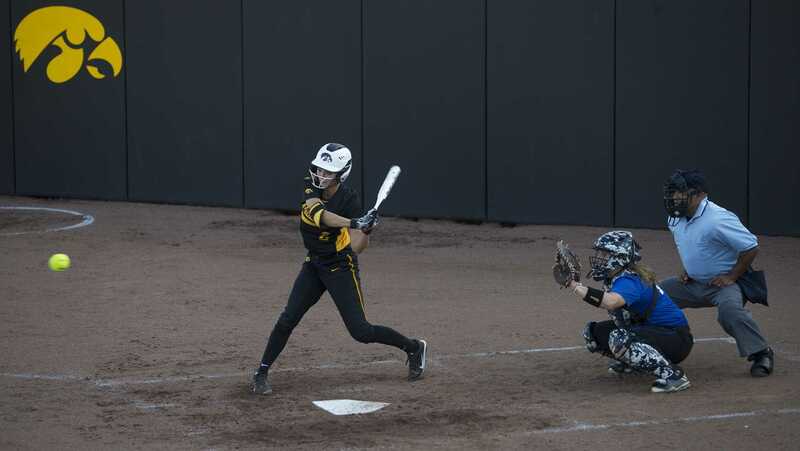 Overall, Iowa was pleased with how the team was able to overcome some of the early miscues. “We had really good sets, really good landings, and we were able to have that presence mindset and make a mistake and do it again is really important,” Reive said in a release. 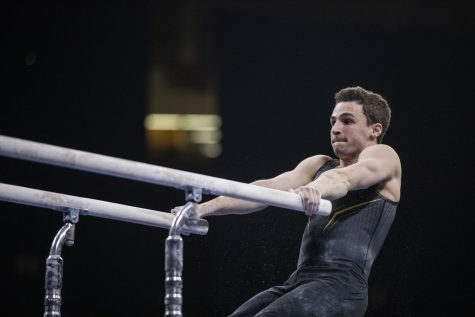 On Sunday, the GymHawks traveled to Ann Arbor, Michigan, to take on No. 10 Michigan. The GymHawks fell to the Wolverines by a score of 197.350-195.375, but earned a team season-high score on vault with a 48.775. 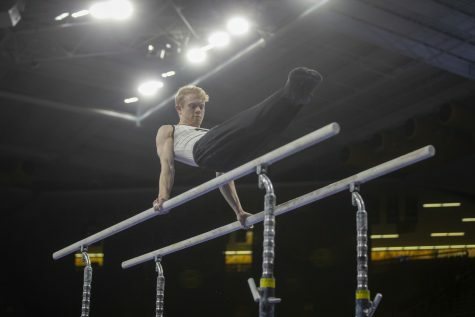 Though the team score came up short, four GymHawks earned career highs. The GymHawks started off strong on bars with a team score of 49.000, with junior Clair Kaji starting things off with a 9.750. Sophomore Emma Hartzler tied her career high of 9.775 to lead Iowa to second place on bars. On vault, freshman Lauren Guerin and Hartzler tallied career-highs with scores of 9.750 and 9.725 respectively. As Iowa finished the meet on beam, senior Nicole Chow registered her a career high of 9.875 to wrap up the meet for the Hawkeyes. The GymHawks will now head back to Iowa City to take on Illinois on Feb. 16 inside Carver.